Home > Gerber Newsroom > Press Releases The Gerber Generation Gives a Big Cheer for its New Star! The Gerber Generation Gives a Big Cheer for its New Star! (FLORHAM PARK, New Jersey) – January 31, 2011 – Upon reviewing hundreds of thousands of the cutest smiles, most adorable poses and irresistibly squeezable cheeks, Gerber has announced the winner of its Gerber Generation Photo Search! 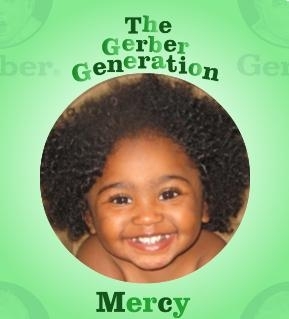 Two-year-old Mercy Townsend of Toledo, Ohio is the grand prize winner of a $25,000 scholarship and will star in a Gerber print advertisement beginning in May 2011. At the beginning of the six month online contest, Gerber judges set out to find children from birth to preschool who demonstrate visual appeal, expressiveness and consistency with Gerber’s heritage and its Start Healthy, Stay Healthy™ mission to nourish a healthier generation one baby at a time. The child who best fit these criteria would be selected to star in a Gerber Generation advertisement that advocates a healthier future for children through good nutrition. Parents could enter their child by uploading their picture onto Gerber’s website. Mercy’s mom entered the contest after seeing it featured on her friend’s Facebook page. She uploaded the winning photo, which was taken right after bath time when Mercy was very happy and her curls where extra full and bouncy. Mercy’s candid expression and adorable features stood out among more than 217,000 applicants and perfectly represented the healthy-looking, happy-looking child in which the brand was seeking. The Gerber Generation marketing campaign was born to give a voice to today’s children and their desire to live healthier lives. The Gerber Generation can take advantage of the Start Healthy, Stay Healthy™ Nutrition System of products and resources from birth to preschool that will help put them on the path to healthy eating. Nestlé Nutrition, part of Nestlé S.A., a world leader in nutrition, health and wellness and is dedicated to infant, healthcare and performance nutrition, and weight management. Gerber Products Company, founded in 1928, officially joined the Nestlé family on September 1, 2007. Nestlé and Gerber’s combined resources and scientific research expertise have enabled the company to become a worldwide leader in early childhood nutrition. Gerber produces more than 200 food products, all of which are a part of Nestlé’s proprietary Start Healthy, Stay Healthy™ integrated nutrition system. Start Healthy, Stay Healthy™ combines products, educational resources and services that are designed to encourage the early establishment of healthy eating habits in children from birth to preschool.